This story contains spoilers for both the film and book versions of Annihilation. 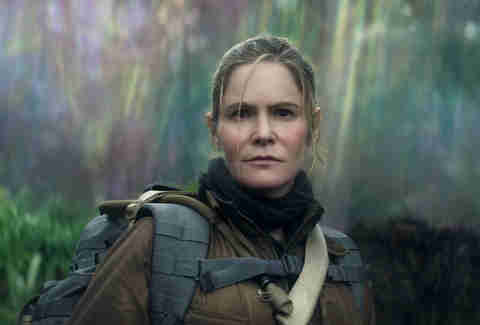 Annihilation, Alex Garland’s bizarre, meditative, at times terrifying Ex Machina follow-up, is nothing like its source material. Jeff VanderMeer’s book is about... a lot. So is Garland’s movie. Oddly enough, the separate tracks they take end up at strikingly similar conclusions. It might actually be a good idea to hold off on reading the novel of the same name (if you haven’t already) until after you’ve seen the movie, so that you don’t distract yourself by waiting for story beats that aren’t going to appear. There's no Crawler, no "strangling fruit" sermon written in lichens on a wall, no tower descending deep into the earth. The characters in the movie are given names instead of titles alone -- the biologist, the linguist, the psychologist -- and some who are dead at the beginning of the book end up alive at the end of the film. Rather than a skull-faced bear, the creature that hunts them in the book is a member of a past expedition, now more animal than human, transformed by Area X into a being whose chilling moans travel across the marshes in the dark of the night. Where the end of the book takes place at the top of a lighthouse, the climax of Garland’s film ends up at the bottom of one -- below one, in fact -- between Natalie Portman’s Lena and a humanoid double that looks like it stumbled off the set of Close Encounters of the Third Kind. There are many examples of films that have little to do with the plot set down on the pages of the books they’re based on -- movies like Blade Runner and The Shining took plenty of liberties adapting text to screen, and created almost entirely new stories out of their source material. Garland never meant to adapt VanderMeer’s entire Southern Reach trilogy, which appeared in rapid succession and consists of Annihilation (February 2014), Authority (May 2014), and Acceptance (September 2014). Instead, he relied on the manuscript of the first book, the rights to which Paramount acquired in 2013, to form his script. The book trilogy's spiraling plot is maddening and makes little sense until you've finished the last one, and even then vagaries abound. Making a movie of just the first means adapting a fraction of a story, had Garland stuck with going by the book beat by beat. 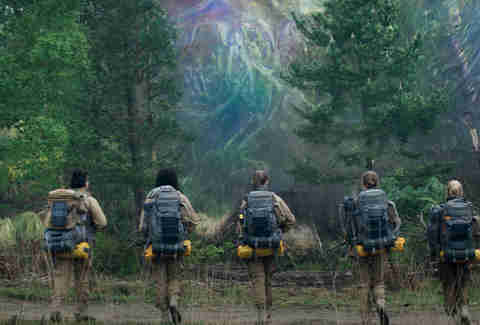 Instead, watching Annihilation having already read the book is like watching someone's dreams about it: Garland takes the bare bones of the novel, some characters, a couple of the themes, and creates something entirely different. At the end of the series you learn that Area X, a mysteriously uninhabited expanse of American land, has been formed by particles left over from an explosion from a far-off planet: a last-ditch effort after an unknown catastrophe to preserve some form of life that then seeds -- or infects, depending on how you look at it -- any fertile new planet it comes into contact with. Southern Reach is the secret agency that investigates strange phenomena in Area X; they're the ones who inadvertently set free the alien particles, which had become lodged in the lens of a lighthouse, eventually causing the ever-expanding Area X.
Garland interprets most of the background information from Annihilation, which becomes important for later books, in a way that makes sense in the context of a single film. In VanderMeer's version, because traveling across the border (termed "the Shimmer" in the movie) is so psychologically taxing, the Southern Reach put their expedition members in a hypnotic trance state to get them across with their minds in one piece. Only the leader of each expedition -- in this case the psychologist -- is aware of the commands that control each team member, and has some of her own that she uses on her fellow explorers to get them to do as they're told. "Annihilation," is a failsafe command for a person to kill herself, as readers learn when the psychologist, terrified, screams it at the biologist. Which brings us to the end of the movie, and to the biologist's confrontation with the expedition's leader, named Dr. Ventress in the movie and played by Jennifer Jason Leigh. As Ventress explains it, Lena's (Portman) own psychology is what draws her to the land beyond the Shimmer: the urge to destroy herself. Annihilation. And it's what allows her to escape. The alien double who mirrors her clones her personality along with her form, and is as drawn to destruction as Lena is. This doppelganger perishes in a lighthouse blaze set by one of the Lena's, as the human Lena escapes. Or does she? In the book, the biologist decides to stay, and it's only later that you learn her double has been sent out into the world by Area X for some unknown purpose, her original form transformed into something no longer human. The film ends far more ambiguously, leaving audiences to puzzle over what's actually happened: Lena and her husband, Kane (Oscar Isaac) hug each other, both irrevocably altered by the Shimmer, which glows ominously in their eyes; they're poised to plant more seeds of change out in the world beyond. It's a very Garland-esque conclusion, a repetition of the android's escape from her facility in Ex Machina. To human viewers, watching our home become altered in some incomprehensible way is terrifying, but to something as alien as a robot or, well, an alien, it would perhaps come as a comfort. In physics, the term "annihilation" means what happens when a subatomic particle collides with its equivalent antiparticle, creating new particles, like an electron and positron smashing together to produce two photons (see where that light comes from?). As Annihilation's Lena calmly says in the film, the process that made Area X is not destroying. It's making something new. Emma Stefansky is a writer whose work has appeared in Vanity Fair, ScreenCrush, and more. Follow her on Twitter @stefabsky.